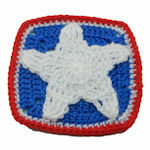 Granny Square Boot Centerpiece -- $1.99 A Crochet pattern from Julie A Bolduc. This crocheted boot centerpiece is fast and easy to make. 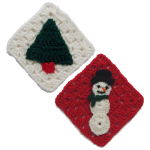 It uses a simple granny square pattern that has a wreath worked into it. I have tucked an empty plastic coffee can inside but you can use anything in it that is the same size.